Paul led people from error to the truth by using the Gospel. But he also taught them that they must STAY in the truth! Philippians 1:21 Whatever happens, conduct yourself in a manner worthy of the Gospel of Christ. Then, whether I come and see you, or only hear about you in my absence, I will know that you stand firm in the one Spirit, striving together as one, for the faith of the Gospel. Perhaps these Christians come to Christ under a false “sales pitch”. Maybe they were told, “Jesus will solve your problems. He will give you peace and joy. He will give you a happy family life. Come to Jesus and enjoy all of these blessings and more. He promises you abundant life.” And so they signed up for what they thought would be a wonderful life of peace and happiness. All of those claims are true but they’re only half of the picture. Jesus promised to give us abundant life in John 10:10. “ . . . I have come that they may have life and have it to the full.” But He also said in Matthew 10:16, “I am sending you out like sheep among wolves. Therefore be shrewd as snakes and innocent as doves.” That picture might not fit into our idea of an abundant life! Ephesians 6:10-18 Finally, be strong in the Lord and in His mighty power. Put on the full armor of God, so that you can take your stand against the devil’s schemes. For our struggle is not against flesh and blood, but against the rulers, against the authorities, against the powers of this dark word, and against the spiritual forces of evil in the heavenly realms. Therefore put on the full armor of God, so that when the day of evil comes, you may be able to stand your ground, and after you have done everything, to stand. Stand firm then, with the belt of Truth buckled around your waist, with the breastplate of righteousness in place, and with your feet fitted with the readiness that comes from the Gospel of peace. In addition to all this, take up the shield of faith, with which you can extinguish all the flaming arrows of the evil one. Take the helmet of salvation and the sword of the Spirit, which is the Word of God. And pray in the Spirit on all occasions, with all kinds of prayers and requests. With this in mind be alert and always keep on praying for all the Lord’s people. It is vital to our survival as Christians that we realize that when we became Christians, we were drafted into God’s army. Daily we are engaged in a battle against an unseen spiritual enemy that seeks to destroy us. If we don’t live with that understanding, then when trials come, as they surely will, we will think something is wrong. We may wonder why God has allowed this. We will not understand the reality of our situation. I have read of even pastors who think that because they are serving the Lord, He should bless them by keeping them from conflict and personal attacks. So when they are criticized or slandered, or when problems hit their families or their churches, they run from the battle. They don’t understand that when God blesses a work, the enemy will increase the attacks against it. When a man’s ministry is effective, the enemy will work overtime to bring him down. Paul did not say, “but there are many adversaries,” or, “there may be many adversaries.” He said, “…and there are many adversaries.” He understood the battle and that adversaries go along with open doors for effective ministry. I have always thought that the harder you strive for Christ, the harder the adversary will attack you. So, what we must understand is that we have to STAND FIRM, knowing that we will face attacks from the adversary, the harder we strive for Christ. “Finally” means “for the rest” and shows us that this section is built on what precedes it. Paul is telling us, “Based on your glorious position in Christ—Ephesians 1-3—and in the light of the worthy walk to which we are called—Ephesians 4-5 and 6:1-9—I want to conclude by explaining to you the serious conflict in which your faith necessarily engages you.” Because we are fighting in the Lord’s army! ourselves. Our strength comes from the Lord. Yet, I think, at the same time, that there is an active sense to the verb also, in that we must take initiative to be strong in the Lord. That same strength is available to every Christian. You may be at your lowest point. You may be discouraged. It may even start to seem to you that God’s promises are not true. But no matter how much may seem to be against you, you can be strong in the Lord and in the strength of His might. You can strengthen yourself in the Lord your God. First, to be strong in the Lord, you must be in the Lord. Now I won’t belabor a point that to most will seem so simple. But I need to say that Paul’s command to be strong in the Lord rests on his first two chapters, where he makes it clear what he means to be “in the Lord”. To sum this up, he wrote, in chapter 2:8-9, “For it is by grace you have been saved, through faith; and this is not from yourselves, it is the gift of God; not by works, so that no one can boast.” To be “in the Lord” means that He has saved you from judgment, by His grace alone through faith in Christ alone. Salvation is not based on anything that you have done or deserved. As we read, one of Paul’s frequent expressions in Ephesians is the phrase, “in Christ” or “in Him”. You cannot begin to understand what it means to be “strong in the Lord” unless you truly are “in the Lord” through saving faith in Jesus Christ. Secondly, to be “strong in the Lord” you must know your own weaknesses. Our pride often blinds us to our true condition. It leads us to believe that we have strength in ourselves. Pride makes us think that the longer we are Christians, the stronger we become. But we can never become stronger in ourselves. In reality, the strong Christian is one who has come to see more and more of his own weakness and tendencies toward sin. That awareness then drives him to depend all the more on the Lord’s strength. To be strong in the Lord, you must know your own weakness. And lastly, to be strong in the Lord, you must know the Lord’s strength. Satan is a powerful foe, but he is only a created being, whereas God is the eternal, almighty, Creator of the universe. If the Lord were to will it, He could destroy Satan in an instant. Christ has already defeated him at the cross and the resurrection, as stated in Colossians 2:15, “And having disarmed the powers and authorities, He made a public spectacle of them, triumphing over them by the cross.” Revelation 20:10 tells us that in His perfect timing and plan, He will throw Satan in the lake of fire, where he will be tormented forever. enemy troops who had surrounded Jerusalem’s people. Proverbs 18:10 declares, “The name of the Lord is a fortified tower, the righteous run to it and are safe.” To be strong in the Lord you must know this strength in a practical way, because you have repeatedly taken refuge in Him and seen His great deliverances in your life. …and you must know His mighty strength. To stand firm with the full armor of God requires three things. 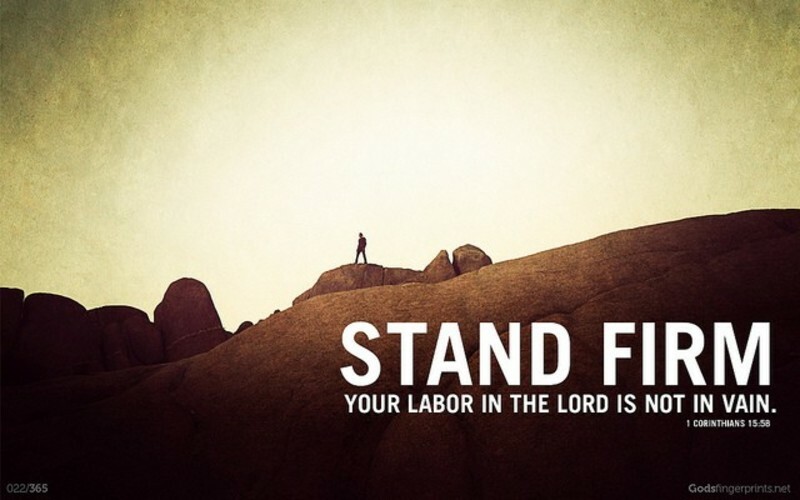 “Stand”, in this instruction, is a key word, repeated in verses 11, 13, and 14. The word comes from the Greek root “to stand”, meaning “to stand against”. It is a military term for holding on to a position that is under attack. It implies the courage to hold your ground because of your allegiance to King Jesus, even when others may be fleeing from the battle because the enemy seems so strong. The armor that Paul uses is a graphic way of saying what he said in Romans 13:14, “Rather, clothe yourselves with the Lord Jesus Christ, and do not think about how to gratify the desires of the flesh.” In other words, Christ, Himself, is our armor. John 14:6 says He is the Truth, Ephesians 2:14 tells us He is our Peace, He is the perfecter of our faith (Hebrews 12:2), our salvation (Titus 3:5-6), and our sword, the Word of God, as told in John 1:1. He is our full armor, capable of protecting us from every onslaught of the devil. Putting on God armor means that in every trial and temptation, by faith you call upon Christ’s strength in place of your weakness. By faith you cry out to Him for deliverance, and strength to persevere. Secondly, we stand firm against the enemy by growing in Biblical understanding. We do this in three ways. defeated Satan, we will not stand firm in the evil day. Paul states in 2Corinthians 2:11, “in order that Satan might not outwit us. For we are not unaware of his schemes.” If we are ignorant of his schemes, Satan will take advantage of us. His schemes invariably use cunning and deception. He often works through secular culture, to carry us downstream with the prevailing ideas of the day. In our day, many Christians are deceived by the ideas of postmodernism, which asserts there are no absolute truths in the spiritual or moral realms. Satan launches repeated attacks on the credibility of Scripture, whether through evolution or by attacking the person of Christ. He uses discouragement, pride, selfishness, the love of money, lust, and many other traps to lure us away from our Lord. To stand firm, we must understand his schemes. Understand where to stand firm and where to be tolerant of differences. If Satan doesn’t get us through his scheme to going along with tolerant culture, he will try to push us the other way be making us intolerant of anyone who doesn’t totally agree with our every point of doctrine. Standing firm against the schemes of the devil means that we stand firm on the core doctrines of our faith. We cannot budge on the Trinity, the person and work of Christ, Biblical salvation, or the inspiration and authority of Scripture. But the Scripture also tells us in Ephesians 4:2 to show tolerance for one another in love. The verse shows us that we will not always agree with each other on every point of doctrine or on every method of how to go about the Lord’s work. To stand firm, grow in understanding of where to do battle and where to tolerate differences. Thus we stand firm by putting on the full armor of God, or as Paul also states it, but putting Christ. And we continue to wear that armor every day, growing in Biblical understanding.